On November 29, 2016 by Decree of the President of Pakistan, Mamnun Hussein, General Qamar Javed Bajwa was appointed to the post of the Army Chief, and succeeded General Rahil Sharif. For the majority of the world, a routine change of commander of the army is an ordinary event, but for Pakistan this is one of extreme importance. Traditionally, the influence of the military establishment on the internal political development of the country has been enormous. Foreign policy, its regional vectors in the first place, are “subordinate” to the generals. The high status of the military command in the country is often justified by the fact that for the longest period of time the country was ruled by the military. And this is true. Discipline, corporate structure, professionalism, adequate and prompt response to challenges formed the army “phenomenon” against the background of constant confrontation between the other state institutions of the country. - Forming a new vector of relations with the monarchies of the Gulf. And, while General R. Sharif had managed to turn the tide against terror in the country, General Q. Bajwa’s challenge will be to keep it under control. This is a basic requirement for security, violation of which would render the implementation of all the other stated objectives very difficult. And the first test of the project for total “eradication” of terrorism would be the issue of the prolongation of the legitimacy of military courts (functioning since January 2015, along with the courts of general jurisdiction) as well as the lifting of the moratorium on the death penalty. According to the 21st Amendment to the Constitution, which expires in January 2017, the military judicial board is authorized to decide on capital punishment against civilians, whose involvement in terrorist attacks have been proven and / or who have been suspected of committing acts of terrorism. The Army Chief signs the final verdict of the death penalty personally. Even before taking office, General Q. Bajwa stated that extremism was the greatest danger for the country. It can be concluded that the practice of military courts will be continued. And the generals once again will be faced with stiff resistance from the civil government agencies, political parties’ aggression, screaming about a potential military coup. In the words of R. Rabbani, Chairman of the Upper House of Parliament, to strike a balance of civil-military relations under the conditions of a “nascent” democracy in Pakistan, is another challenge for the newly appointed Chief of Staff. General Q. Bajwa has already faced an open confrontation with religious-right parties. Madrassa reform (under the National Action Plan (NAP), initiated by the generals and approved by both Houses of Parliament in the spring of 2015, is progressing slowly due to the failure / sabotage by Islamic leaders in many educational institutions to undergo the official registration procedure. Legitimization includes disclosure of sources of funding and the introduction of a state education course. According to statements by Pakistani researchers themselves, students are exposed to indoctrination by radical Islamic mullahs, who often preach sectarian hatred in madrassas and mosques. Thus, for the army command the completion of the madrassa reform is directly related to the implementation of the state’s internal security doctrine. General Q. Bajwa also “inherited” the order (in the framework of the NAP) to implement the FATA reforms; referred to as the zone of the Pashtun tribes. In addition to returning hundreds of thousands of internally displaced persons to several agencies, (the army relocated local residents on the eve of the operation in North Waziristan in 2014), the development of infrastructure and social facilities after artillery and air strikes are other challenges for Q. Bajwa. In particular, the challenge for both the generals and civilian government agencies is the process of the constitutional compliance of FATA (the Constitution of 1973 does not apply, rather the practices of indigenous tribes are enforced) for the purpose of voluntary entry into the Khyber Pakhtunkhwa province. Thus, General Q. Bajwa has been tasked with “taming” the Pashtun tribes in Pakistan, “to close” the debate with Afghan nationalists about the Great Pushtunistan and to convince the authorities of Kabul to recognize the Durand Line as the official border between the states. In selecting a candidate for the top military post, N. Sharif gave him the task of guaranteeing the security of the country during the period of preparation and holding of the general parliamentary elections in May 2018. The importance of a democratic pre-election campaign is very high for the Sharif clan. The Prime Minister’s younger brother, Shahbaz Sharif (Chief Minister of the largest province of Punjab), plans to nominate himself, win and… replace Nawaz as Prime Minister. Since April 2015, the national backbone project for Pakistan has been the Sino-Pakistan economic corridor. In November this year, the first trade ‘caravan’ started out from the Chinese Kashgar to the Pakistani port of Gwadar on the coast of the Strait of Hormuz with further transshipment to sea vessels and then on to the markets of the Persian Gulf and North Africa. Implementation of CPEC stimulated internal and external challenges. Even before the signing of the CPEC contract, People’s Republic of China (PRC) Chairman Xi Jinping received assurances from the command of the federal army to protect and maintain the security along its entire territory. For example, in Balochistan the CPEC section is 870 km. The first kilometers of the CPEC run through areas of Gilgit-Baltistan in the vicinity of the Line of Control. India has repeatedly made sharp statements about legal violations and the impractical route layout. 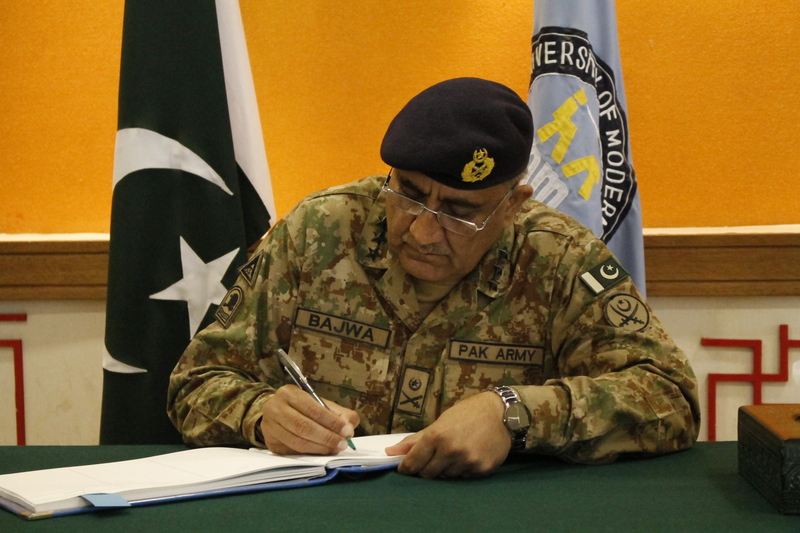 Here, General Q. Bajwa’s experience and knowledge will come in handy, having many years of experience in law enforcement service in Kashmir and the northern areas of the country, when he commanded the military division of the Northern Territories. The task of strengthening security has already led to the formation of two additional army units in the federal army. The more, the merrier. The deep-water port of Gwadar on the coast of the Strait of Hormuz is the point of interface of the land and sea routes of the new Silk Road. It provides opportunities for multimodal modern global trade, which increasingly uses Class Triple-E container ships. Defense and security of the coastline and military base on the coast, as well as the organization of maritime trade in the port requires strengthening the security of navigation conditions. This poses new challenges for the Pakistan Navy, including the expansion and modernization of the of warship fleet. One of the challenges, which General Q. Bajwa will have to respond to personally, is the status of the former Army Chief. General R. Sharif has already received wide popular recognition and respect, and is hailed as a national hero. His photographs are attached to the windscreens of most local residents’ cars. The success of the large-scale military operation “Sword’s Strike ” in North Waziristan Agency to eradicate foreign militants and later the fight against domestic terrorism in the hinterland, in the provinces of Sindh, Punjab and Balochistan have earned him deserved respect. By the Constitution of 1973, General Q. Bajwa has also been given three years of service in his new post. This is a short period to rise to the rank of a national hero.